$NYXBT (Bitcoin), 11/20/18, bull trend signal. TSP (11/21)= 4409.72. 3-month chart. Current price for 4 symbol package = $7,500 quarterly. 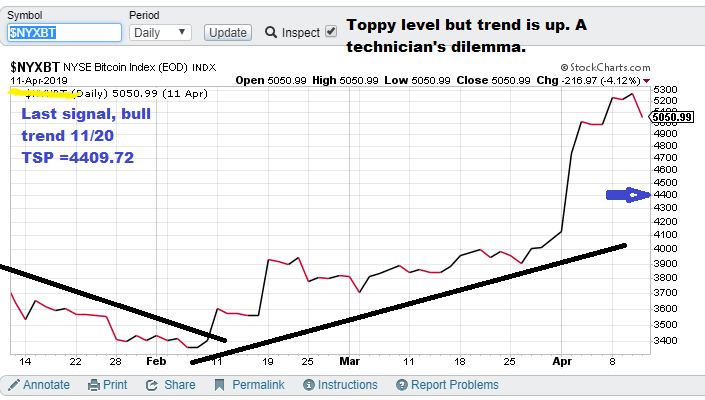 Model notes: This post was made mid-day on March 8 showing EOD chart from March 7th. 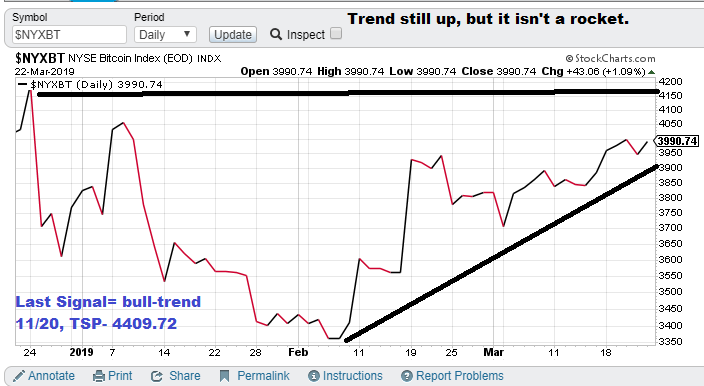 Model is still in the bull trend mode. The “catch the falling knife” buy (11/20 signal) was a little early, and is still under water but the situation is becoming more positive. Recent nonlinear projections are looking north of the recent 3-mo closing high (approx. 4200). 5000 is not out of the question. The model is still in-synch with the trading. Bitcoin forecast ($NYXBT): The fading volatility seen in Jan and early Feb has resolved itself to the upside with near-term trading breaking out above the 3-month down trend line. As stated earlier the nonlinear models are now projecting toward the 5000 range. So we are not looking for the 4200 resistance point to hold. 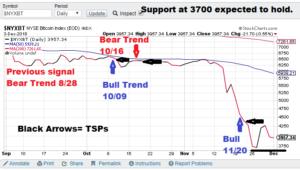 Model notes: The was in good position for the November Bitcoin collapse, though the “catch the falling knife” buy (11/20 signal) was a little early, the downside momentum has dried up. The model is still in-synch with the trading. 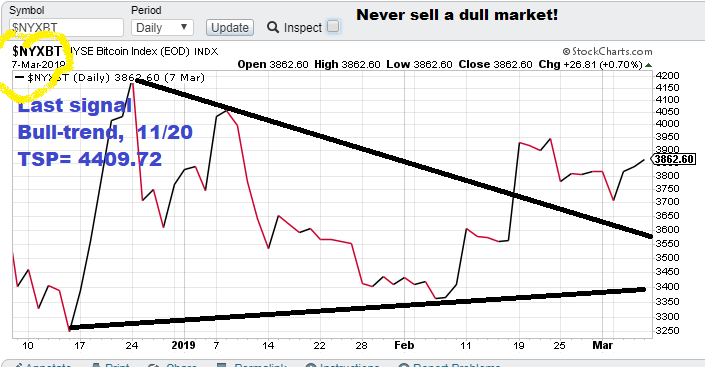 Bitcoin forecast ($NYXBT): The model “falling knife” bull trend signal was a little early but not irrelevant as following trading revealed the downside momentum was drying up. There are some associated positive fundamental factors at work here too. The recent stock market drubbing (flight to quality), interest rate drop (asset valuation enhancement) and financial stress for Bitcoin miners (at the sub 4000 level) are all in play right now. And the outlook for the trade currently? 6000! Model notes: The model caught most of the power slide, entering long just a couple days too soon. Still a look over the past three months reveals a very positive, prescient model. Note: The following comments are based on using technical analysis to ‘flesh out’ our nonlinear trading signals. TSP is defined as the closing price on the trading day following the signal day. Bitcoin Forecast (Bullish) ($NYXBT): The model took a swing at catching the “falling knife.” We got in a lot closer to the bottom than the previous top. 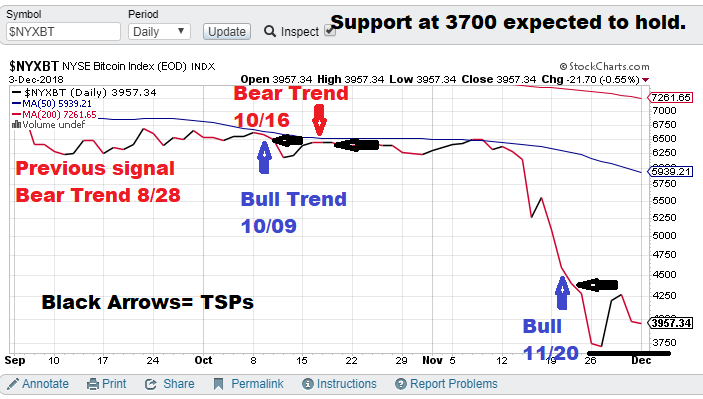 Further good news is that the math indicates the 3700 level will provide stable support. Finally, recent downside volatility seems to be drying up.